Sushi may very well be the most well-known dish among all the Japanese cuisines. It’s a delicious combination of seasoned rice, raw fish, and toppings. Fortunately, this iconic dish is not something you have to go to Japan to get. Delicious sushi can be found all over the world. In fact, if you are looking for some of the best sushi in the Charlotte, North Carolina area, you can stop by Nikko Japanese Restaurant, and we’ll treat you to some truly delicious sushi. If you come into our restaurant, things are pretty relaxed. While our decor and ambiance are reminiscent of an upscale New York City restaurant, we don’t expect you to follow all of the Japanese restaurant manners. However, if you do ever get the chance to go to Japan and gorge on some of the world’s best food, you may want to brush up on your Japanese dining etiquette. For example, do you know if you should tip? What about how to offer compliment? Or how to properly use chopsticks? If not, don’t worry, 1) because you’re not alone, and 2) because today we at Nikko Japanese Restaurant would like to share with you some essential dining tips. Although it could probably go without saying, be sure to greet your host when entering the restaurant. Even if you do not speak any Japanese, exhibiting a friendly and cordial smile will do just fine. If, upon arrival, you are given a warm towel—called an oshibori—use it to wash your hands. It should not be used to wipe your face or any other part of your body. And after you have done this, try to roll it up in the same way that it was given to you then set it aside. Don’t rub chopsticks together. This can be disrespectful to the Japanese restaurant since it may signal that you think their utensils are cheap. Never leave your chopsticks sticking straight up in food. This too closely resembles a funeral ritual. Either lay them flat on top of your bowl or lean them on the chopstick rest. And after you have finished your meal, return your chopsticks into the paper covering if that is how they were brought to you. Although it may be a common practice for U.S.-based sushi connoisseurs, never mix wasabi into your soy sauce plate. This is considered to be poor manners. Instead, if you want wasabi, you are expected to place a small amount directly onto the roll or under the fish. Nigiri, which consists of a thin slice of fish on top of vinegar rice, can be hard to eat with chopsticks. For this reasons, it is acceptable to eat nigiri with your hands. In light of the last tip, we should add that, while it is okay to eat nigiri with your hands, you should never eat sashimi with your hands. This is a Japanese cuisine reserved for chopsticks. If you are sharing and taking something from a communal dish or someone else’s plate, you are supposed to turn your chopsticks upside down so that you are touching the food with the part that hasn’t been in your mouth. When eating sushi, aim to eat it in one bite. Sushi is not meant to be cut in two, and if you do this, you will likely inadvertently cut the sushi chef’s heart in two. Never point at someone using your chopsticks, and never pass food from chopsticks to chopsticks. Both of these behaviors are considered rude. When eating soup, slurping with gusto is not only acceptable, it is considered to be in good taste—this is why if you go to any ramen or noodle shop in Japan, you are sure to hear a chorus of slurps and smacks. The pickled ginger, known as gari, is not intended to be a sushi topping. Rather, it is supposed to be a palate cleanser eaten on its own. While you can use a spoon, it is perfectly acceptable to eat your miso soup by picking up the bowl and sipping from it. If you are eating with others, you should never pour your own drink. Pour your companions and then they should do the same for you. Tipping is not customary in Japan. If you tip, don’t be surprised if your waiter comes chasing you down to give you the money you forgot. If you are truly impressed with your meal, however, some sushi bars will set out a special jar for you to tip the sushi chef. But perhaps the best tip is a happy “domo arigato” (thank you for the meal). Or alternatively, you could try to buy you and your sushi chef some sake and down it together. As with stores all across Japan, small money trays are used when paying for your meal. This is also true for restaurants. Don’t attempt to hand money directly to your waiter. Instead, place your money on the tray. If you were happy with your Japanese cuisine, be sure to compliment the chef. Sushi chefs, for example, spend a lot of time crafting the perfect rice to go with fresh fish. Acknowledging their effort can be the perfect way to end your meal and ensure a fantastic dining experience. All this being said, if you commit any faux pas, know it’s not the end of the world. Most Japanese restaurants tend to give foreign visitors a pass. However, while you will likely not be deemed a savage if you don’t follow all of these rules, being aware of them and behaving accordingly can signal a great deal of respect and help build connections with you and your host country—which at the end of the day is what traveling is all about. Where Can I Find Seriously Good Sushi? 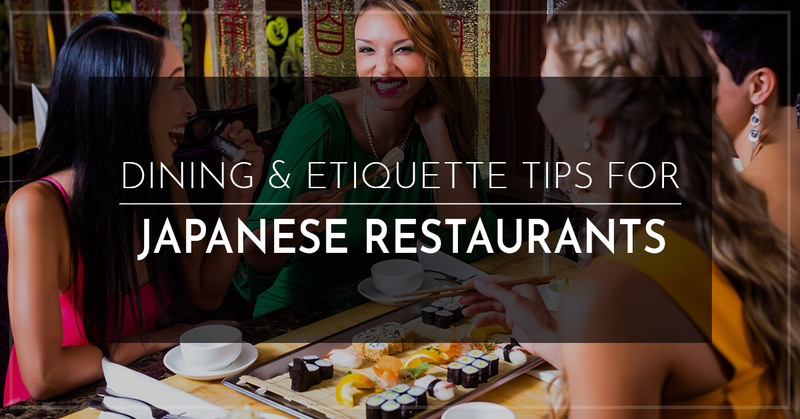 Are you in the Charlotte area and looking for a Japanese restaurant to try out these tips? Stop by Nikko Japanese Restaurant today! Our menu includes a wide array of superbly crafted sushi rolls as well as other Japanese foods. Check out our sushi menu and dinner menu, and contact us to schedule a private party or catering services.